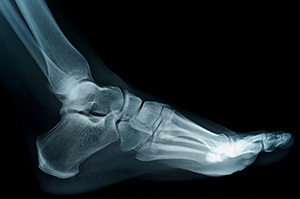 Where Can Fractures Of The Foot And Ankle Occur? Like fractures within other areas of the body, these injuries usually occur as a result of a fall, automobile accident, fight, sports injury or other types of injury, and often cause pain, swelling and bruising. Symptoms tend to get worse while walking. We offer specialized knowledge and care for the treatment of fractures. The Doctor's at Thomas Podiatry & Associates will treat your injury every step of the way until it is completely healed. Bone fractures can be diagnosed by physical examination and an X-ray or CT scan. Immobilizing the area is often helpful in relieving pain before proper treatment begins. Treatment for bone fractures depends on the location and type of fracture, as well as the patient's medical history. We take all of these factors into account when developing a treatment plan. Mild fractures, including stress and greenstick fractures, usually only require the conservative treatment methods of ice, rest and anti-inflammatory medication. Moderate fractures may require splints or braces along with pain medication. The immobilization helps relieve pain and speed up recovery. More severe fractures may require surgical treatment, especially open fractures with wounds that need to be closed. After the proper treatment is performed, the rehabilitation process begins. It is important to care for your fracture while it heals. Full healing can take several weeks to several months. Our staff will advise you on how to care for your fracture and helpful measures you can take to ensure a speedy and healthy recovery. To learn more about Fractures & Podiatric Services, please contact us at 410-749-0121410-749-0121 today or click here to schedule an appointment.